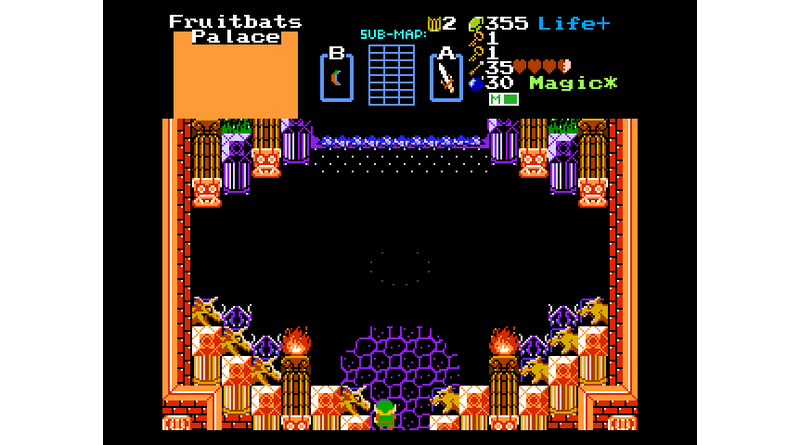 -The special item is overriding him, and makes him disappear and there is no guy in a cave giving you a message. How do i make it so he appears and stays there? Edited by SkyLizardGirl, 06 February 2019 - 05:19 PM. It's sounds like you need to set a "Guy" type. You can find this under Screen->Guy or by hitting the "G" hotkey. So putting a Guy in the Bottom cave on every map is the key for getting it to work anyways? If a doorway to the Wise-man in a cave is in same screen as Special item / Chest - outside the cave, >the Chest makes the Wise-man in cave inside 'disappear' and 'not operate' i mean. There is no text message from within the cave. Do i Need some kind of Script to Over-ride this? So Caves with old-men on the world-map can be on the exact same screen as Treasure Chest / with special item inside? Edited by SkyLizardGirl, 07 February 2019 - 11:55 PM. Ok, i got the Cave Guys to work by Using >Screen >No FCC Carryover. The wise-men and their Messages show fine if a Warp to Cave/Cellar stairway is set in any dungeon screen. ^However Notice Special item is Set - Instead of my Shop of 3 Items.' -When i enter the stairs. >But Now it messes up the shop/Wise-man cave by only showing 'the Special item' in front of the Wise-man from the screen you just received it from from above. ^I take the Item from the Chest Above the stair. If you either take the Item from Above or below > It Erases the Wise-man and makes him Vanish.' -below in the stairway. i can't Somehow Cancel out the effect of the Special item from the screen Above?? IS There ANYTHING i can do to Override this from happening so that My shop Appears Correctly? Or is this a problem that needs a Script or even a New feature in the ZC Editor like a 'New Checkbox' - just to stop this from happening?? Edited by SkyLizardGirl, 08 February 2019 - 02:12 AM. I think you may need to toggle the DMAP flag for "guys and special items are in caves instead of cellars". But, I think I understand what you are trying to do. Unfortunately, there is nothing built directly in ZC to do this. You can get the "guy" to talk, but once you place the special item, it will over-ride your chest. There are ways around this with scripting. You could use an NPC script to make the player actually talk to the "guy" and then be able to place the chest. You could you use a chest script. There is a big benefit to the chest script. You can have more than one on a screen. Using the chest script, you can set up your "guy" talking and place the chests. However, they can only be used once, so you cannot have them re-appear for shops. Both of these scripts can be found in the Script DB. Question? Do you know how to add scripts? There is no Tutorial Video on youtube to show this. I am having tons of trouble because i cant figure out how to add scripts. Exactly which script is this?? Edited by SkyLizardGirl, 08 February 2019 - 05:15 PM. I created a File of every Script inside my - Mystical-Harps - Zelda Game Quest. Can somebody Install a script in it where 'Special item' won't mess with the Wise-man Caves warp or dungeon Cellars? I do know how to import 1 script all together at least, i just kinda want this to be a Global script that Just automatically works when you start up the game. Can you just make the code work without assigning it to item or combo or etc? Edited by SkyLizardGirl, 08 February 2019 - 09:16 PM. I do not understand what you want here. I have a script that replicates the Z1 guy room. Edited by SkyLizardGirl, 12 February 2019 - 09:47 PM. Heheh. I made the script, and the video for Joeiiii on AGN. Good to see that its usefulness continues.